Here’s a healthier no-bake pumpkin pie that uses only whole foods ingredients and has no added sugar. We just use dates, which are a natural sweetener. 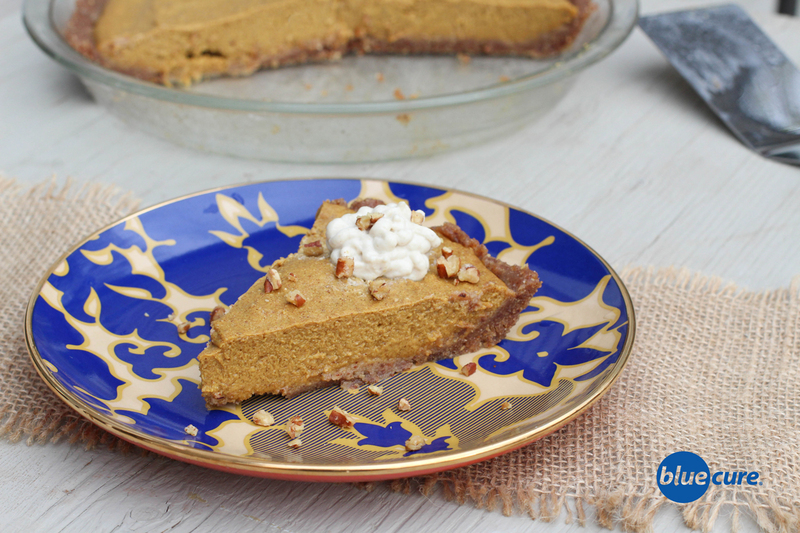 It’s just as sweet, and even more satisfying than standard pumpkin pie since it’s packed with nutrient dense ingredients. Pie that’s only made with ingredients that will provide you sustaining energy and make you feel good inside and out! In a food processor, pulse the almonds or walnuts until fine like flour. Add in the pitted dates and continue to pulse until the mixture sticks together. Pat the crust in a 7-9 inch pie pan, being sure to add the crust to the bottoms and the sides. Freeze the crust for 15 minutes. While the crust is setting, combine the pumpkin, cashews, flax, cinnamon, nutmeg, cloves, and dates in a high-speed blender. Add in 1/4 cup of water to help with the blending, add more as needed for thinning. Avoid adding too much water at once since the mixture should be thick. Blend until smooth and no lumps remain. Place the pie filling in the pie curst and place in the freezer to allow it to set for ~2 hours. Just before serving, remove the pie from the freezer and allow it to thaw. Enjoy! To make cashew cream look like whipped cream: soak 1 cup of cashews in hot water for 30 minutes. Drain off the water and then pour into a blender. Use 2 tbsp – 1/4 cup water for every 1 cup of cashews. Blend until smooth. For best results, allow the cream to set in the fridge overnight to thicken even more. You will need cake decorating tips and a tube. Scoop the frosting into the tube, and then top onto the pie.